Sony Pictures wisely decided not to unveil The Brothers Grimsby to critics. Would that they had shown the same deference to the general public… There are bad films and then there are bad films. This is a textbook example of the latter - a production that fails in every way at every turn. Why the (arguably generous) half-star? There is one funny gag in the entire (mercifully short) 83-minute running time. It comes during the end credits. If you’re still there and have maintained a semblance of sanity, you may get a laugh out of this. I wouldn’t recommend staying for the end credits just for the joke. In fact, I wouldn’t recommend staying for the beginning credits. This movie is so atrocious I kept waiting for Nick Cage to show up. The Brothers Grimsby is a straight comedy. By that, I mean the story (the foundation of most movies) is a meaningless contrivance - a device so moronic and infantile that no viewer could possibly care about its development or resolution. That’s not unusual for a certain brand of comedy but it puts an inordinate amount of weight on the jokes. They have to be frequent, consistent, and funny. Many films have trouble with one or two of those characteristics. The Brothers Grimsby is perfect in its failure. It takes a special film to amuse audiences on a level where things like plot and character become irrelevant. ZAZ found the recipe with some of their efforts. So did Mel Brooks. And the Pythons. But not the people behind The Brothers Grimsby. The story, to the extent that it matters, is about the reunion between two long-separated brothers. Nobby (Sacha Baron Cohen) is an Idiot with a capital “I” who lives in a cramped flat with a repulsive, oversexed wife (Rebel Wilson). Sebastian (Mark Strong) is a black ops secret agent seeking to keep billionaire philanthropist Rhonda George (Penelope Cruz) from being assassinated. When Nobby’s ill-considered plan for a reunion results in Sebastian missing a critical sniper shot, he is branded a traitor by his boss (Ian McShane). With only his lovely assistant (Isla Fisher) on his side, Sebastian must drag Nobby along with him on the run. Hilarity ensues… provided you’re watching another movie. Director Louis Leterrier, known best for helming The Transporter and its sequel before moving up the food chain to The Incredible Hulk, probably wishes he had changed his name before embarking on a journey into this nuclear wasteland. Although he can’t entirely be absolved of blame (there’s nothing on his resume that would indicate he’s capable of crafting something this awful), Cohen is most likely the responsible miscreant. In addition to giving a cringe-worthy “performance,” he gets a co-writing credit. 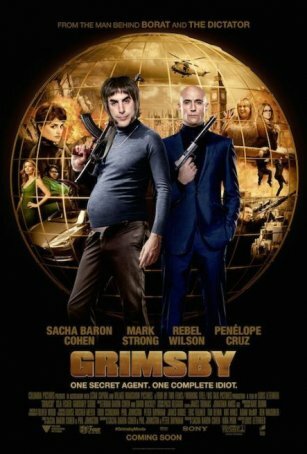 If I had departed at the start of the end credits, rather than sitting stunned in my seat for about 30 seconds trying to recover from the experience, The Brothers Grimsby would have gotten a nice round zero. Sadly, the one nugget of comedic gold arrives just in time to ruin the film’s dubious perfection. [SPOILER: “Did you meet the rest of the team?”] It’s dangerous to make statements in March along the lines of “this is the worst movie of 2016” but if there’s something more horrible waiting in ambush then it may be time to retire from this line of work.